Finally, I come to the job I was aiming to do all along: get Panda3D working on the Rasp Pi. This is not a task for the faint of heart – at least without guidance. Setting up distcc to compile is only the first hurdle. If you manage to figure out all the dependencies and complete a compile, most likely Panda3D will be sluggish, many features (e.g., texturing) will be missing, and the program will crash if you nudge it even a little bit. All of these symptoms are the result of a regular compile that tries to use OpenGL. However, when it doesn't find a GPU that supports OpenGL, Panda3D will fall back to using the CPU, which is a very suboptimal solution. The trick is figuring out how to compile Panda3D to use OpenGL ES and the on-board Broadcom GPU. ES stands for Embedded Systems and is the subset of OpenGL used for games and graphic-intensive programs on smartphones and, yes, the Rasp Pi. Fortunately, Thomas Egenhofer has done the legwork and published an excellent guide . However, his guide needs a bit of updating and a few tweaks to work perfectly on a distributed compile. The Panda3D developers recommended this list themselves, except I have taken out one package specific to Nvidia. Rasp Pi doesn't come with a Nvidia GPU, so you won't need it; in fact, it would interfere with the correct working of Panda3D programs. The output should be minimal – at most, a couple of lines mentioning what has been rejected, if anything. You can safely ignore the message. you will see each component pop up as it is compiled. Figure 2: If you "follow" the distcc logfile on the compile node, the tasks scroll by as they occur. where <XXXXX> is the version number. Installing the DEB also takes a while, so be patient. Using distcc on a quadcore i5 at 2.8GHz (a pretty old machine), the compile took about 22 minutes (Figure 3). Bearing in mind that my prior attempt to compile on the Rasp Pi only reached 30% after 24 hours before locking up the machine completely, that is a substantial boost! Egenhofer compiled using Raspbian within a virtual machine and managed to compile on a similar computer to mine in two hours. It seems pretty clear that distcc is the winner for both convenience and speed. Figure 3: Compiled in 22 minutes instead of over 6 hours. Not bad at all. in a terminal window (Figure 4). 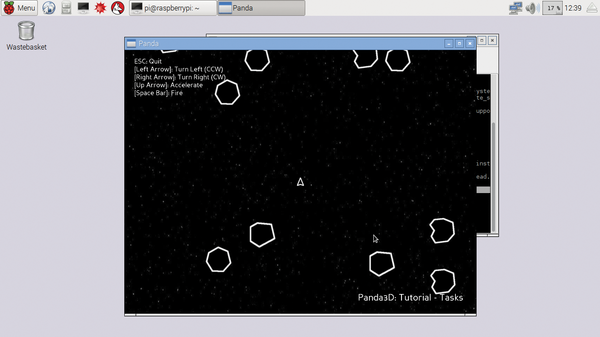 Figure 4: Playing a match of Panda-powered asteroids. Some projects just show a blank window with the message: Video driver reports that Cg shaders are not supported. These projects use OpenGL-only extensions and cannot run with OpenGL ES. The program I wrote for Raspberry Pi Geek #16 does work, though. Then, you need to upload the Arduino sketch gyro.ino, using a regular x86-based computer, to the Arduino 101, because the 101 is a rather new board and is only supported in the latest versions of the Arduino IDE, which is not yet available for the Rasp Pi. 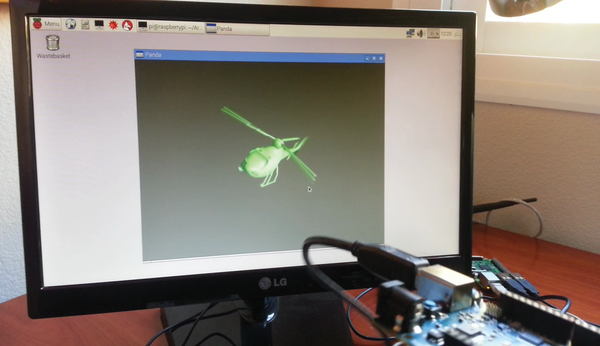 Notwithstanding, the Python program copter.py works just fine from the Raspberry Pi, as you can see in Figure 5 and a YouTube demo . Figure 5: Making a Panda3D object twist and spin by waving around an Arduino 101 works on the Raspberry Pi! Create super easy Pi programs to turn on lights, speak to you, or control motors.